These materials were created for a Diversity Symposium and Luncheon put on by the Human Relations Council in Clarksville, TN. The event was to bring the community together and talk about how small businesses owned by minorities are benefiting Clarksville. The campaign, "I Am Clarksville" was launched during this event highlighting minority-owned businesses around the community. This project was completed while I worked at MediaWorks. Along with the invite, there was a ticket made for a food station at the even, pictured right. The pattern seen on the invite and ticket were inspired by different cultural patterns. Included were African, Korean, Japanese, and Mexican patterns. 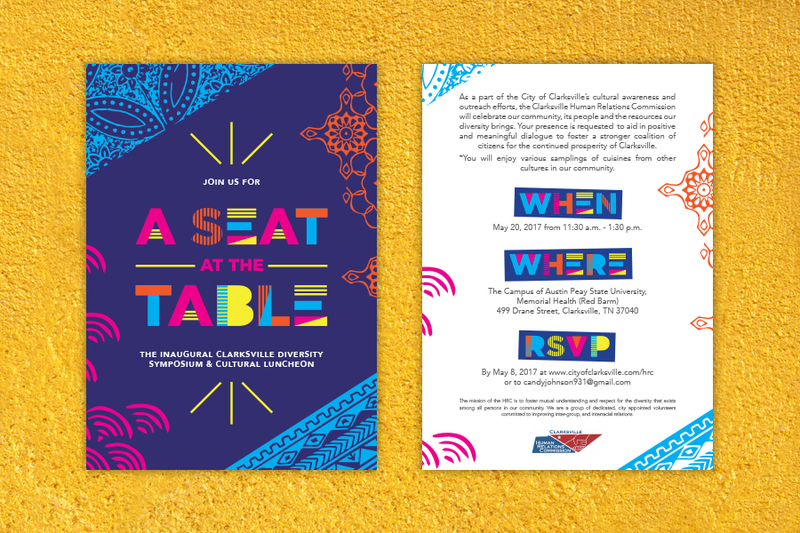 I wanted it to tie into what the event was actually about, and the client wanted a "celebration" feel to the invite and ticket, since they were celebrating the diversity of Clarksville.